and take part in the discussions! In Write NOWW: Critical Conversations, the panelists will be discussing writing reviews for a variety of media, including books, films, and movies. The discussion will centre around various topics, including the value reviews bring to our culture, evolution of each panelist's writing style, and important things to consider when approaching this writing form, all with the end goal of eliciting strategies to be employed in writing better, thoughtful reviews. 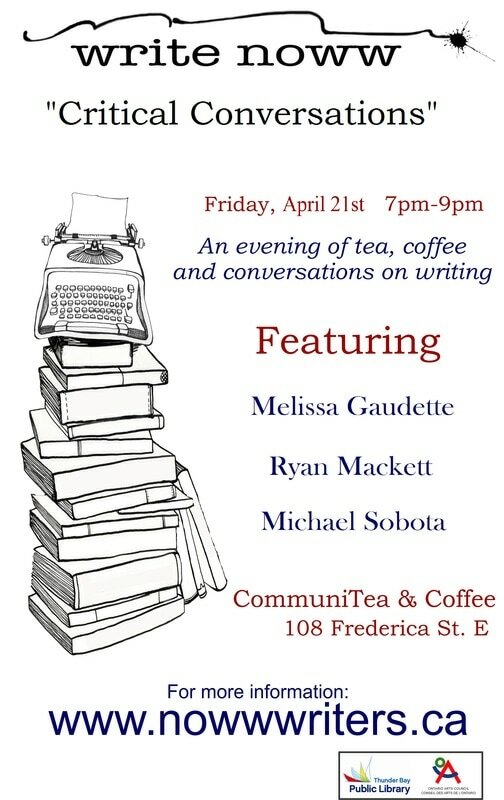 Our panelists at this Write NOWW event will be Melissa Gaudette, Ryan Mackett, and Michael Sobota, all of whom come to us with a great deal of experience with this form of writing. We're sure to be treated to what will no doubt be a very interesting talk! Originally from Thunder Bay, Melissa has a passion for everything creative. Having been published for over 15 years, Melissa has written for numerous outlets, including The Walleye and, most recently, The Tribune 242, published out of Nassau, Bahamas. Melissa shares her love of syntax when she teaches English at a secondary school in Nassau. Having lived in The Bahamas for two years, her hobbies include being a prolific writer, watching sunsets, appreciating Junkanoo, and staying ever vigilant for pirates. Ryan Mackett was born, raised, and lives in Thunder Bay. He is an artist, photographer, writer, film enthusiast, and former teacher. Ryan graduated from Lakehead University with an Honours Bachelor of Fine Arts focusing on sculpture and printmaking; he also holds a Bachelor of Education. When not carrying out creative pursuits, Ryan is the Community Stewardship/Public Relations Officer with the Lakehead Region Conservation Authority, a position he has held since 2011 which allows him to exercise all of his creative muscles. Ryan is a weekly contributor to The Chronicle Journal and he writes for the blog Channel 807. Follow him on Facebook @tbaymovieguy and email him at tbaymovieguy@gmail.com. Michael Sobota was born and raised in Independence, Wisconsin. After graduating university with an honours degree in Speech & Communication and spending a year with a professional touring theatre company, Michael immigrated to Thunder Bay in 1969 – when the city was still Port Arthur and Fort William – receiving full Canadian citizenship in 1981. Michael co-founded and worked in Kam Theatre Lab, touring Northwestern Ontario and Canada. He co-founded and was the Executive Director for AIDS Thunder Bay for 25 years and served on The Ontario Advisory Committee on HIV/AIDS for 24 years, working with 11 different Ministers of Health. Upon retirement, Michael taught courses in the Department of Sociology at Lakehead University for two years and served as the Chairperson of the Board of the Lakehead University Student Union. Michael returned to active work in theatre, directing plays for Cambrian Players and New Noise Productions as well as contributing to the 10x10 Annual Playwrights Showcase. Throughout his adult working career, he continued making contributions to local media, publishing poetry, and having plays produced. Michael is currently contributing to three local print publications: The Chronicle Journal, The Walleye, and Thunder Bay Seniors. He’s addicted to movies, reading, and life in Thunder Bay.